Felix Galimir was an Austrian violinist and teacher born (in Vienna) on May 12, 1910. Although he was one of the early members of the Israel Philharmonic (the Palestine Symphony Orchestra) he did not stay there long. Today, he is mostly remembered for having taught at the Juilliard School of Music for some time and his long tenure (more than four decades) at the Marlboro Music Festival. He also enjoyed a very successful career as an orchestral player and chamber music player. Galimir entered the Vienna Conservatory at age 12 (some sources say age 14.) He studied with Adolf Bak and Simon Pullman and graduated in 1928. He played the Beethoven concerto in his public debut performance. He studied further with Carl Flesch in Berlin in 1929 and 1930. He had by then already founded the Galimir String Quartet with three of his sisters (1927 – the sisters were Adrienne on second violin, Renee on viola, and Marguerite on cello.) Between 1930 and 1936, he must have had numerous engagements in Europe both with the quartet and as a soloist, though I am simply assuming that to be the case. In 1936 (one source says 1934), he recorded Alban Berg’s Lyric Suite and Ravel’s string quartet with the Galimir Quartet. It may have been the first recording of the Berg Suite. Some sources claim it was the first recording of the Ravel quartet though it was not, it was the second recording of that work – the first recording of the Ravel was by the International Quartet in 1927. The Galimir recording won the Grand Prix du Disque in 1937. Also in 1936, he was accepted into the violin ranks of the Vienna Philharmonic although he was forced out in 1937. He had until then only been a regular substitute player at the Vienna State Opera. He (and two of his sisters – one of them being Renee, the violist in the quartet) then went to Palestine, having been urged to do so by violinist Bronislaw Huberman. His father and his other sister left for Paris. In 1938, he came to the U.S from Palestine and played a solo recital at Town Hall the same year. He was 28 years old. He founded another Galimir String Quartet (which played for radio broadcasts at WQXR) and joined the NBC Symphony in 1939, then being led by the ill-tempered conductor, Arturo Toscanini. Mischa Mischakoff was the concertmaster at the time (and remained so until 1952.) Galimir stayed until 1954, when the orchestra was disbanded. 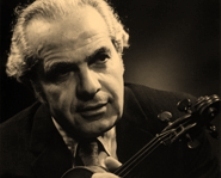 Galimir then served as concertmaster of the NBC Symphony of the Air from 1954 until 1956. Also in 1954, he began teaching at the City College of New York. He finally joined the Juilliard faculty in 1962. The Curtis Institute (Philadelphia) appointed him to its faculty in 1972 (some sources give an earlier date.) In 1976, he began teaching at the Mannes College of Music. Galimir recorded many times (on the Vanguard, Period, Decca, and Columbia labels) as a member of chamber groups, orchestras, or as soloist. A rare live performance of a rarely heard Beethoven piece (on YouTube) is available here. He remained active until just a few weeks before he died, on November 10, 1999, in New York City, at age 89. The quartet with the Galimir name had finally disbanded in 1993, after 65 years. Among Galimir’s students are Mark Kaplan, Hilary Hahn, Jennifer Koh, Miranda Cuckson, Leila Josefowicz, and Ani Kavafian. Note: The Capet SQ recorded the Ravel Quartet in 1928. It's on my channel (2ndviolinist). Thanks for the info on Felix Galamir.